Jared Schure’s practice focuses primarily on special education law, including Section 504 and civil rights issues. 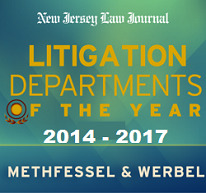 He has successfully represented school districts throughout New Jersey in special education matters from inception through appeal, in both State and federal court. Mr. Schure is also an experienced negotiator, having participated in many successful settlement and mediation sessions throughout the State. Mr. Schure joined Methfessel & Werbel in September 2013. After law school, Mr. Schure served as law clerk to the Hon. Bryan D. Garruto, J.S.C. (Ret. ), in the Superior Court of New Jersey, Middlesex Vicinage. As law clerk, Mr. Schure was responsible for managing the judge’s motion calendar, drafting judicial opinions and orders, and providing the judge with comprehensive legal research and analysis. Moreover, he was certified as a civil mediator. After being admitted to the New Jersey Bar in 2010, Mr. Schure spent several years working as a civil litigator for two prominent plaintiffs’ law firms in Northern New Jersey. While attending law school, Mr. Schure served as judicial intern for the Hon. Tonianne J. Bongiovanni, U.S.M.J., at the United States District Court in Trenton; as intern for the New Jersey Office of the Public Defender in Newark; and as summer associate for the multinational law firm of Pearl Cohen Zedek Latzer, in Herzliya, Israel. Mr. Schure co-authored an article in the New Jersey Law Journal discussing individual liability under the New Jersey Law Against Discrimination, and was featured on the 96th episode of AM Best’s Insurance Law Podcast discussing this important area of law. He has lectured on special education law for the National Business Institute and New Jersey Institute for Continuing Legal Education. In 2018 he was named by Super Lawyers as a Rising Star for excellence in the practice of education law. Prior to law school, Mr. Schure worked as a research assistant at the Center for Chronic Disorders of Aging at the Philadelphia College of Osteopathic Medicine, where he co-authored a study in the Journal of Cell Biology on the effect of stem cells on embryonic muscle development. Mr. Schure is a member of Methfessel & Werbel’s Civil Rights Defense Group under the direction of Eric L. Harrison.